I’m Alison Walsh from HMRC’s Digital Services for Business & Agents (DSBA) team, here to tell you about our fantastic Self Assessment 2016 campaign. We work on creating and developing digital services to provide our business and agent customers with the information they need, when they need it. 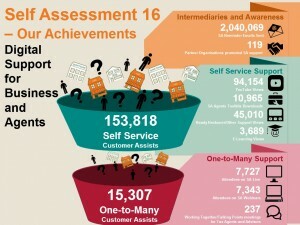 The 2016 Self Assessment has been a real test of our services and I’m really happy to report some amazing results this year. Around 15,000 people logged onto our live ‘one-to-many’ webinar sessions: a substantial increase on the year before. We held extra sessions over the deadline weekend and over 2,500 customers attended between Friday and Monday alone. We’re so pleased we were able to help so many people and their feedback has generally been really good. We’re already analysing the results of this year’s digital services usage and feedback to help us improve what we’ve got and create more of what people want for next year…. So how do the 'numbers' stack up so far?